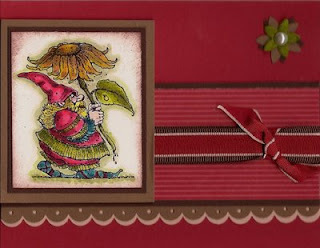 The Shabby Stamper: I miss my Knobbly Gnomes, too!! True to the Splitcoast CC180 color challenge, I layered Ruby, Cocoa and Blush. I would've never thought to combine these! Neat combo -- I like it. I combined Chocolate 5/8" grosgrain and RHR taffeta ribbons for the Ribbon Stacking challenge. I LOVED Knobbly Gnomes! This is a fabulous card!